I’m dreaming of summer here in the Northern Hemisphere! 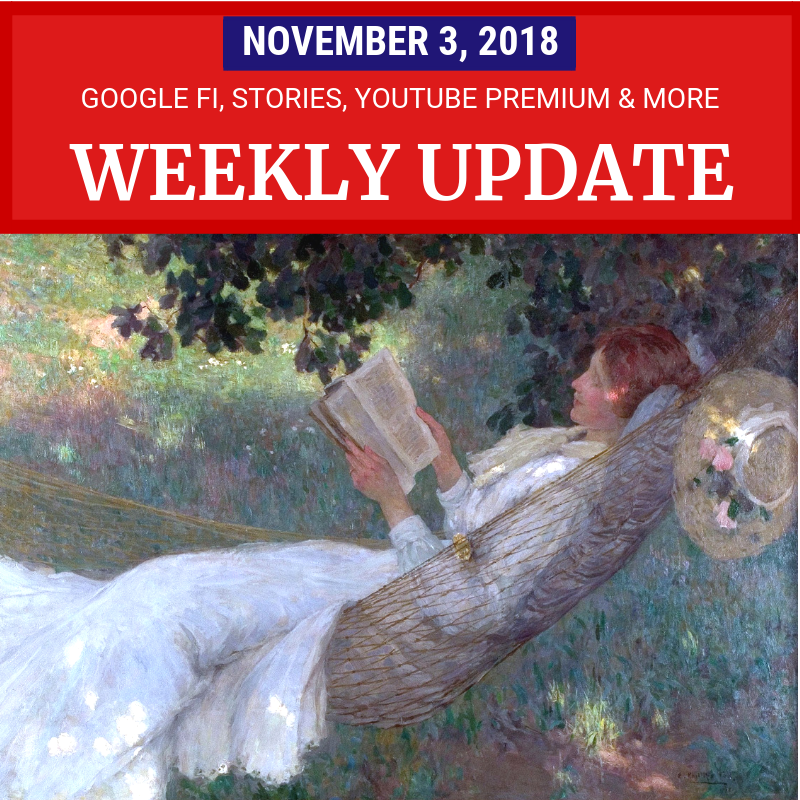 As we head into the last month of the year, there was a major announcement from Project Fi, plus some nice updates from YouTube and more. The big news this week was that “Project Fi” - Google’s mobile network that launched in 2015 - has graduated to “Google Fi” and now officially supports most newer Android phones and iPhones. There is a catch: Fi’s unique technology to seamlessly switch between multiple cellular network and new enhanced network features only work with “designed for Fi” phones. If you are interested, you should check compatibility of your phone.And if you decide to give it a try, use my referral link and we’ll both get a bonus (click here). YouTube Stories are rolling out to all eligible channels with at least 10,000 subscribers. Creator Insider has some answers to creator questions (https://www.youtube.com/watch?v=jFIGg5OKO7Y). Stories are meant to be more “casual” content, and are only available for 7 days after they are posted. YouTube announced they are retiring “lower usage features” in January, most notably old Annotations. The Annotations editor was retired well over a year ago, but there are many older videos that still have the (sometimes annoying) desktop-only annotation boxes and text. Those will be removed mid-January, and YouTube is encouraging users to add Cards and End Screens in their place. Also in January: ad-supported “Shows” playlists become regular playlists, Movies become standard videos and video credits (but not caption credits) will be removed. YouTube has launched US-only YouTube Premium and YouTube Music Premium Student Plans. If you are an eligible student, it looks worth checking out (and yes they are verifying student status). Instagram now lets you share Stories with a limited group of “Close Friends”. In a more exciting initiative, Instagram is working to improve accessibility by adding automatic alternative text. This uses object recognition technology to generate a description of the photos. You also have the option of writing your own custom alternative text. People using screen readers can then hear that description. It’s also been speculated that the alternative text may improve search engine indexing of Instagram images. Business reviews in Google Maps can now include hashtags. Read on for more tips and updates for educators, webmasters, list makers and more. Updated March 2019 to remove Google+ links. After more than 5 weeks (since 12 October 2018), i still not receive my Pin Verification. Based on my account information, Pin Verification mail from Google sent to me on 12 October 2018. My address or location - Malaysia. And on 16 November 2018, i requested second Pin Verification to the same address. Until now 4 weeks (4 December 2018), i didnot receive any mail yet. For your information, i use my actual house address and previously i dont have any issue to receive any mail or product from local or oversea.